The Menard-Gaborit Domain is a family story since 1734. The Société Civile Menard-Gaborit is a company founded in 1988 by two brothers: Philippe and Thierry. Philippe and Thierry Menard are now running this beautiful estate, located in the heart of the Sèvre & Maine vineyard (name stemming from the names of the two rivers flowing through the county) the Domain Moulin de la Minière is mastering the Monnières district. The estate is covering 69.5 ha of vineyards: 63 ha of AOC Muscadet Sèvre et Maine, planted with Melon de Bourgogne grape variety, 3 ha of VDQS Gros plant, planted with Folle Blanche grape variety and 3.5 ha of Vin de Pays des Marches de Bretagne, planted with Gamay and Cabernet grape varieties. In a strong position thanks to the good experience passed on from older generations and thanks to technological progress, we make our wine with passion, respect and professionalism. Our wines are painstakingly elaborated in one concern: to create real pleasure during the tasting and to share with you and your friends. An intense golden color which places the taster in good condition for the next steps. After aeration this wine shows all its power: very pleasant gingerbread and fresh white mint aromas. During the tasting, this Muscadet had kept some very tiny and fine bubbles, we say “slightly beady”, the nose begins with some daffodil aromas, a hint of citrus and some more complex dry fruits and almond aromas. In the mouth, the wine is clear, smooth and supple. 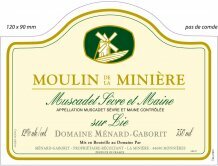 This very well balanced Muscadet is the regular representation of a great soil on which grows an old vineyard. Mineral as it must be, very long lasting in the mouth, this wine has the potential to be kept in a proper cellar for few years. A very nice representation of the ideal association of the vineyard, the ”terroir”, the vintage and the “savoir faire” of Mr. Philippe Menard, this Muscadet win will perfectly fit with fish, oysters and with any seafood. AREA OF PRODUCTION: Val de Loire / Sèvre & Maine APPELLATION: A.O.C Muscadet sur lie PRODUCTION: 2600 HL VINEYARD: 65 ha GRAPE VARIETY: Melon de Bourgogne SOIL: Clay-siliceous AGE OF THE VINEYARD: 20 to 30 years old VINIFICATION: During winter months, after the alcoholic fermentation, the wine gets clearer. Natural sediment sinks slowly and stays at the bottom. It is what we call “lees”. “On lees bottling” means that the wine is directly bottled from the tank where the lees are. Our Muscadet is vinified according to a traditional method passed on by older generations, in a modern vat house: destemmed grapes, pneumatic press “Bucher Grand Cru”, temperature control during winemaking process operated by flags, winemaking process control and first cuvee selection are done in terms of age, soil and exposition of the vineyard. At that stage, the quality of the vintage is entirely depending on the winemaker’s knowledge, computed follow-up, Reasoned Agriculture Certification given by the French Ministry of Agriculture.